The most effortless means of mining ARO in Windows platform is by using the miner that is already integrated in the LightWallet. 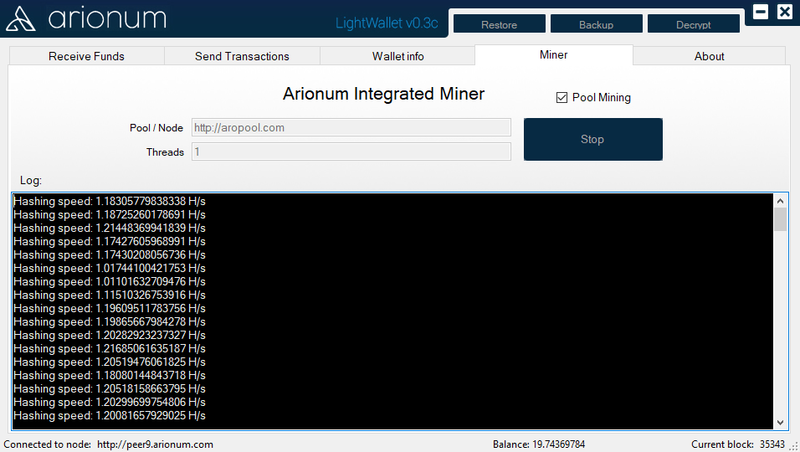 Just launch the LightWallet, find the Miner tab, indicate the Pool/Node that you’d like to party with and the number of threads you would like to use up. Untick the Pool Mining if you want to go solo flight. Leave it as is, otherwise. Hit the Start Mining button when you’re all satisfied with the settings and then the mining begins! Well, here is the list of known pools listed on the Discord channel, in case you want to join other available pool(s). You’re already mining! As easy as that! If you would like to get maximum performance form your current machine being used in mining ARO, read this post.